"Deadpool 2," "Solo: A Star Wars Story," and "Avengers: Infinity War" are just a few of the blockbusters heading to theaters this Summer. Summer starts early this year in Hollywood with the potentially record-breaking release of "Avengers: Infinity War" Thursday, and the marquee Marvel superheroes couldn't be coming at a better time. The box office for the year is down nearly three percent, and the industry is looking to redeem itself after last summer, which, despite hits like "Wonder Woman," had its worst performance in more than a decade. Although all studios are embracing the year-round blockbuster schedule and massive hits can emerge in any month, like "Black Panther" in February, "It" in September and "Star Wars" in December, with work and school vacations, nothing can beat the summer's potential. This summer movie going season, which typically runs from the first weekend in May through Labor Day, could get things back on track. Two of the most profitable franchises have major films on the slate. The Walt Disney Company and Marvel have "Avengers: Infinity War" (April 27) which some experts are predicting will score the biggest opening of all time, and Universal Pictures is releasing the sequel to the fifth highest domestic earner of all time, "Jurassic World: Fallen Kingdom," on June 22. 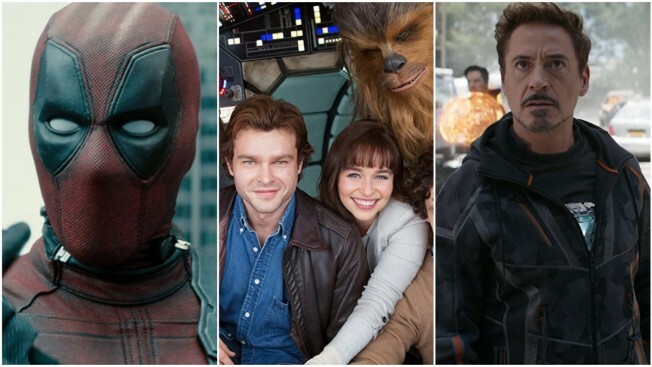 And as with every summer, there are more than a handful of sequels and familiar brands coming to theaters, including: "Deadpool 2" (May 18); "Solo: A Star Wars Story" (May 25); "The Incredibles 2" (June 15); "Sicario: Day of the Soldado" (June 29); "The First Purge" (July 4); "Ant-Man and the Wasp" (July 6); "Hotel Transylvania 3: Summer Vacation" (July 13); "The Equalizer 2" (July 20); "Mamma Mia: Here We Go Again!" (July 20); and "Mission: Impossible — Fallout" (July 27). But Wall Street Journal reporter Ben Fritz whose new book "The Big Picture: The Fight for the Future of Movies," examines the current state of the industry, notes that while the big, franchise, tent-pole films are always the highest-grossing and that films like "Jurassic World 2" and "Avengers: Infinity War" will be sure-fire hits, oversaturation is possible too. "People do like to see the big franchise tent-pole films," Fritz said. "But even if the studios make more of them, people are not going to more movies. The more of them there are, the more they are competing for the same box office dollars and as a result you see more flops." According to Box Office Mojo, in 2017, movie ticket sales were at a 25-year low, and competition for audience attention is only intensifying. Netflix has a whole slate of summer films too, from an Adam Sandler and Chris Rock comedy ("The Week Of," April 27) to the WWII-set adaptation of "The Guernsey Literary and Potato Peel Pie Society." This year too has shown a concentration of box office dollars on just a few films — "Black Panther," Fritz noted, accounted for 23 percent of the ticket sales in the first three months of the year. And it's at least part of the reason why many studios are touting the diversity of their slates beyond the spectacle of superheroes and blockbusters. "Today, it's even more important that there is a wide variety of films out there, films that are provocative, that are thrilling, that obviously are entertaining and that you're presenting them in new and exciting ways," said Jim Orr, Universal Pictures' president of domestic theatrical distribution. "We have right now a theater-going audience who is discerning and I think we need to keep that in mind with everything we put forth." Universal has "Jurassic World" and "Mamma Mia!" sequels, sure, but it is also releasing Dwayne Johnson's action-thriller "Skyscraper" and its indie arm Focus Features has films like the dark dramedy "Tully" (May 4), with Charlize Theron, Spike Lee's "BlacKkKlansman" (Aug. 10) and documentaries about Mr. Rogers ("Won't You Be My Neighbor," June 8) and Pope Francis (May 18). Warner Bros., home of Wonder Woman, Batman and the other DC Comics superheroes, doesn't even have a major DC film on the slate this summer (aside from the animated "Teen Titans GO! To the Movies," July 27). Instead, its slate boasts films like the star (and female)-driven "Ocean's 8," with Sandra Bullock, Cate Blanchett, Rihanna and others, comedies like "Tag" (June 15) and "Life of the Party" (May 11), and an adaptation of the popular book "Crazy Rich Asians" (Aug. 17). "The business just gets spread out over 12 months," said Warner Bros. domestic distribution president Jeff Goldstein. "It's not about one particular season and for a studio, it's about opportunistically dating your movies in a way to maximize your box office on any given film." Beyond "Ocean's 8" there are a number of gender-flipped reboots and bawdy female-led comedies, like "Overboard" (May 4) with Anna Faris, the "Dirty Rotten Scoundrels" remake "The Hustle" (June 29) with Anne Hathaway and Rebel Wilson, "Book Club" (May 18) with Jane Fonda, Diane Keaton, Candice Bergen and Mary Steenburgen, and "The Spy Who Dumped Me" (Aug. 3) with Mila Kunis and Kate McKinnon. And action fans can look forward to Mark Wahlberg as an intelligence officer trying to smuggle a police officer out of the country in "Mile 22" (Aug. 3) and Jason Statham fighting a shark in "The Meg" (Aug. 10). Audiences thirsting for more unconventional fare may just have to look a little deeper for the potential hidden gems, like "Uncle Drew" (June 29), a comedy about an aging basketball team competing in a street tournament, with Lil Rel Howery, Kyrie Irving and Shaquille O'Neal, and "Hereditary" (June 8), a trippy horror about the strange things that start happening when a family's matriarch dies. Sundance breakouts coming this summer include "Eighth Grade" (July 13) from comedian Bo Burnham, which follows an eighth grade girl around her last week of middle school, "Blindspotting" (July 20) about a police shooting in Oakland, and "Sorry to Bother You" (July 6) also Oakland-set, but with a quirkier sci-fi edge. There's the almost too-strange-to-be-true "The Happytime Murders" (Aug. 17) from Brian Henson and starring Melissa McCarthy, where puppets and humans co-exist and a private eye takes on the case of a puppet on puppet murder. And then there's "Hotel Artemis," the directorial debut of "Iron Man 3" screenwriter Drew Pearce. It's an original action-thriller about a hospital for criminals set in a dystopian, near-future Los Angeles with a star-studded cast including Jodie Foster, Sterling K. Brown and Jeff Goldblum that Global Road Entertainment is releasing on June 8. Pearce said there was no way he could have gotten it made in the studio system. "Hopefully this is a rallying cry. It's not a sequel, it's not based on a comic. It's not a reboot. It's its own eccentric and hopefully loveable beast of a movie," Pearce said. "I think what we've seen in the last year is movies with real personality are actually what an audience is crying out for, whether that's tiny movies that made good like 'Get Out' or taking the superhero blockbuster like 'Thor: Ragnarok' and essentially making a quirky New Zealand comedy out of it," he said. "I think there's a real appetite for something that's just a little different and a little less cookie-cutter."